3 March 2018 – Dig Delve – An online magazine about gardens, landscape, growing & making. 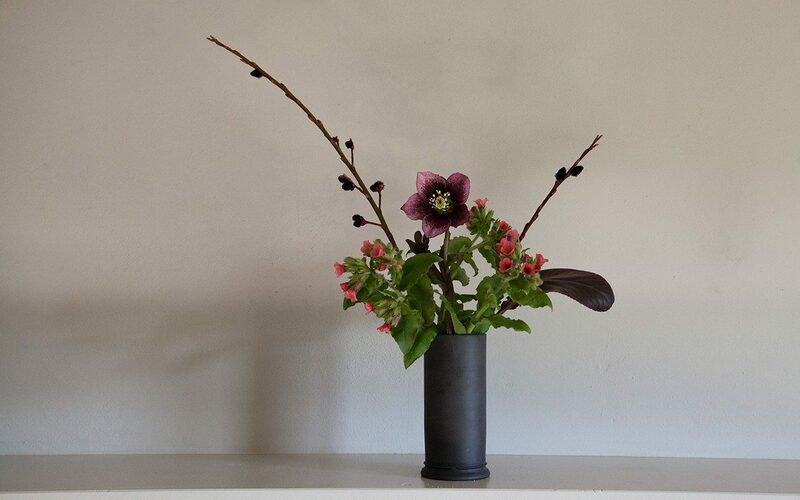 The first posy of March was picked last week, ahead of the cold north-easterlies and the snow that plunged us back into winter. The galanthus, the primroses and the wild narcissus that just last week were tilted in bud, are buried now in snowdrifts as March comes in, roaring like a lion. In the garden the hunt for new life has also been halted, but we have gained the time to seek out the minutiae of change. Newly visible buds, stark and green against the whiteout on the hawthorn and the Cornus mas in full and oblivious flower. 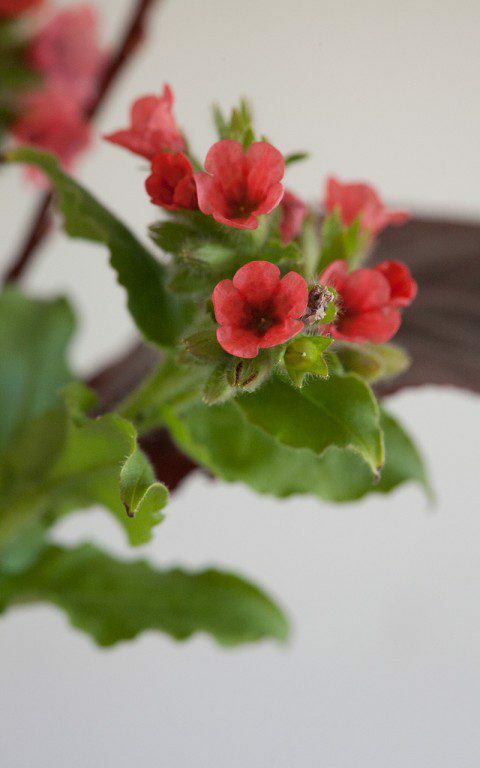 The Pulmonaria rubra stirred early in January and, beneath the snow they are already flushed with bloom. I was given a clump by our neighbour Jane and, having never grown it before, I can confirm that it is a doer. The silvered and spotted-leaved lungworts are arguably more dramatic, for they provide a textured foil and foliage that is easily as valuable as their spring show of flower. Give them shade and summer moisture and they will reward you, but the slightest sign of drought and they will sadly succumb to mildew. It is important, therefore, to find them a place that keeps cool. Pulmonaria rubra, however, seems altogether more adaptable and when the thaw comes they will flower unhalting until summer. Despite its modest presence – it has plain, green foliage and soft, coral flowers – I have enjoyed its willingness and ease on the sunny banks close to the studio where, from the veranda, you can hear the buzz of bumblebees. They love it, as do the first early honeybees and the heavy soil there suits it too. So far it has taken the sun and dry summer weather with no more than a little flagging in midday heat. I have planned for shade with the young Salix purpurea ‘Nancy Saunders’ that grow alongside and for there to be hellebores there when I have the shade for sure. The lungwort and the Lenten roses will be good in combination and we have experimented here in the bunch with a spotted dusky pink hybrid, whose colouring makes something more of the lungwort. This year it became clear that the red hellebores are just that bit later than the blacks, greens, yellows and picotees, whose earlier buds were ravaged by mice. Sometimes disasters teach you as much as triumphs. 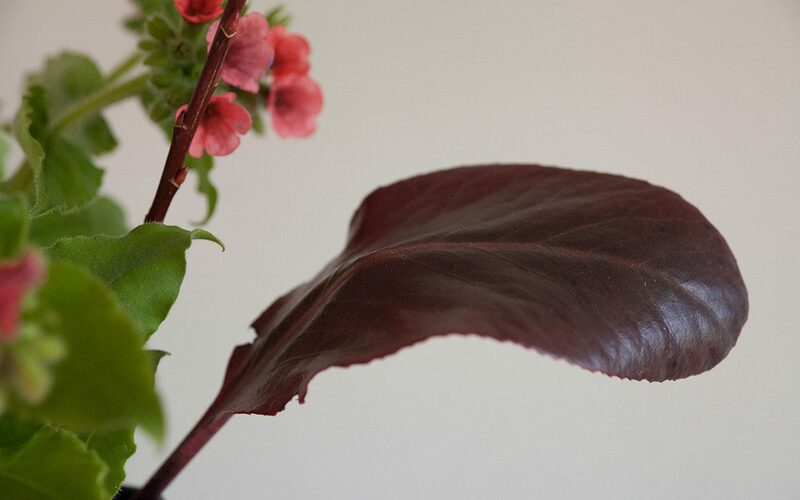 The last of the winter is held in the Bergenia purpurascens which colours from a deep, coppery green to the colour and shine of oxblood leather in the cold months. 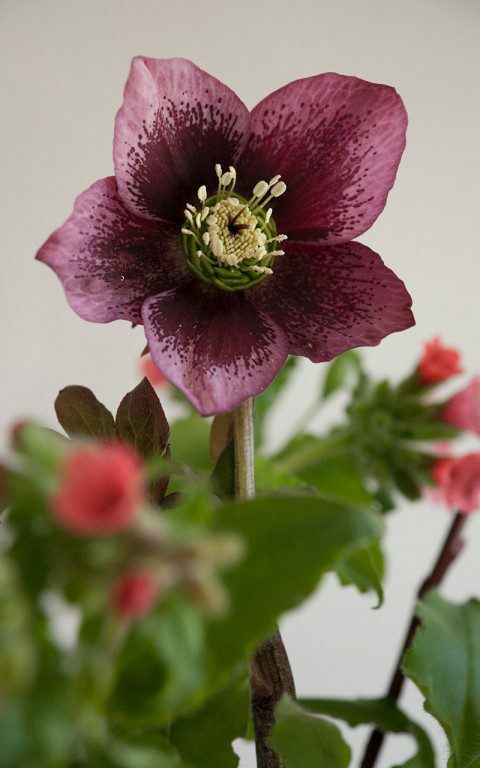 This form, which I first saw growing in Beth Chatto’s gravel garden, was initially called ‘Helen Dillon’ after the Irish plantswoman and gardener, but has now been renamed ‘Irish Crimson’. I like it for the scale of the leaf which is finely drawn and held upright to catch the winter sun. Though bergenia are a stalwart of shade, it is worth finding Bergenia purpurascens a position in sunshine so that the leaves can be backlit in winter. The glowing foliage makes up for the absence of flower elsewhere and is a foil to the first bulbs. I have just one clump which is slowly increasing, but I plan to split it on a year on/year off basis to have enough to mingle it with fine stemmed Narcissus jonquilla and white violets. Though bergenias are tough and reliable, I have found that they are magnets for vine weevil. The tell-tale notches to the edge of the leaf are made by the adult and these signs will show you that there are grubs eating the roots. An autumn application of nematodes should help in controlling the problem if it develops. Salix gracilistyla ‘Melanostachys’ is an easy, compact plant which I’ve chosen to grow hard in the gravel surrounding the drive. 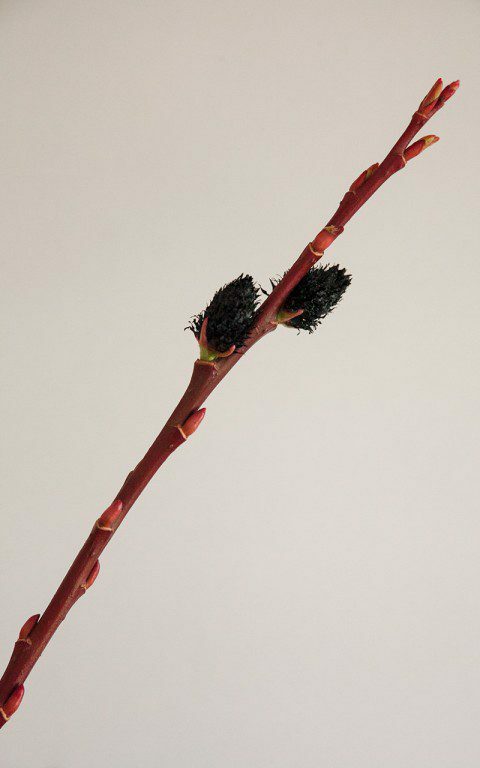 It has lustrous stems that start out green before turning blood red and throwing out coal-black catkins from early February. They are a surprise and a delight and, some time in the next couple of weeks, each will push out a glowing halo of red anthers. For now, they are planted up at their base with Erigeron karvinskianus to cover until they bulk up. They won’t take long to reach a metre or so in all directions. As they shade out the erigeron, I have also included Viola odorata for its willingness to take their place in the shade. Next year I will add snowdrops to provide a contrast to the darkness of the willow. They will be easy to keep to a waist high bush with the longest growth being pruned out for catkins as an accompaniment to the last of the winter or the first of the spring pickings. I picked this posy last Sunday with mum on my mind. My brother was looking after her, giving me a day’s respite from sharing the care of her at home at the end of her life. I didn’t know then that she would leave us so quickly this week. However, looking at the spareness and sombreness of this arrangement now, shows me that somewhere deep down I did. Mum loved hellebores. Coral and old rose were two of her favourite colours.